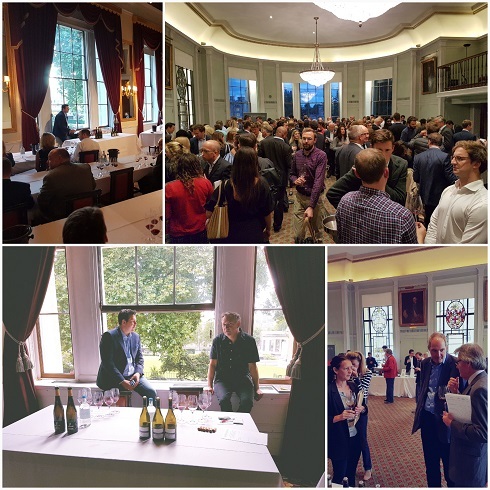 Yesterday we held our ‘Annual Tasting’ – the biggest showcase event for our wines each year. As we closed the doors of the beautiful Trinity House at just after 8.30 last night the whole team were ‘abuzz’ after a fabulous, exhilarating day of tasting, chatting to the 20 winemakers who came to present their wines and catching up with so many customers and journalists too. With winemakers making huge efforts (many mid-harvest!) to join us, jetting in from Croatia, France, Spain, Portugal, Austria, Germany, Italy, New Zealand & South Africa – a happy, warm and relaxed atmosphere was soon filling the room and this only built as the day went on. Judging by the reaction of tasters the wines did us proud too. In all, nearly 300 people came to taste their way through the 120 wines we had open. The brilliant array of journalists and our wonderful customers found much to enjoy in the all-encompassing selection. From brilliant Bobal to ripping Rieslings via bright Bordeaux gems and some high pedigree Italian Stallions, the whole world of wine was on show. As ever this is a great opportunity for us to introduce our new ‘signings’ but also give ‘old friends’ a moment in the spotlight. With so many gems to choose from it is always this selection process that is the hardest part! For the first time this year we added a Masterclass to the day. An amazing Pinot Noir discussion and tasting was led by Nick Mills from Central Otago’s ‘Rippon‘ and Stefan Braunewell from ‘Weingut Braunwell‘ in the Rheinhessen; This was a fascinating insight into the challenges and joys of producing Pinot Noir on either side of the globe, much enjoyed by all 60 attendees. Please see the link below for details of all our exclusive wines that were open to taste yesterday, and don’t forget all visitors can recoup the cost of their tickets with any orders to the value of £250 or more if you place your order by close of play Monday. To order please reply to this email or contact your usual L&S Contact or shop.